Sydney Shop Girl: A Post Patrick World. Roughage. A Post Patrick World. Roughage. 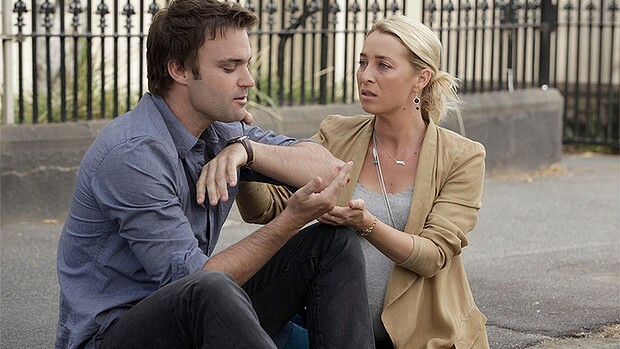 I'm just resurfacing after having fully processed that Patrick was the character who died in this week's Offspring. It is okay for me to spill, isn't it? The news is two days old already and the centre of an Australian media frenzy. Which is perfectly understandable for many reasons. Not only is Offspring great television but the only other big event in local television in coming days will be the first Election 2013 debate between Messrs Rudd and Abbott at the National Press Club on Sunday. Have you got your telly snacks and drinks sorted yet? Back to Offspring. Next week's season finale will probably be even more of a tear jerker than this week's. It'll be a departure from the usual happy, mad cap season enders that I've come to love with Offspring. Next season will be an interesting one for Nina (even more so than usual) as she comes to terms with her grief and role as a single mother. I know the writers will handle these issues with the sensitivity that they deserve yet will still inject some whimsical humour into the story lines. Sometimes, laughter and crazy dream sequences are all you have to get you through life's trying times. That, and deep breathing and being completely in the moment. All of which, I am sure Nina Proudman will do with great style and verve. Baby SSG has been discovering the power of the printed word this week. He's loving how satisfying it is to tear the cover off back issues of The Australian Womens' Weekly and then chewing on selected strips of them. I've spent this morning clearing his mouth with my finger and then putting the pieces of Bec Hewitt's face together to make sure he hasn't actually eaten any paper. If he has, though, does it count towards his daily fibre intake, I wonder? And on that note, take care and have a lovely weekend. I'm still recovering from last episode! I was expecting Billy too die or even Jimmy but definitely not Patrick. I was a wreck for an hour after the show finished. It was just so sudden. Every time I think about Nina hugging Patrick on life-support I tear up.. As you said it'll be a huge new season for Nina.. I'm not happy about it but it'll be interesting to see how it's presented! It was pretty intense, wasn't it? It took me a while to get back to the real world after as well. I went to my Fella's place for a roast and some emotional support on Wednesday evening. It's all a bit heartbreaking. I think I might find the show a bit sad from now on. That was the only show I watched religiously. I am catching up with Time of our Lives on iView - that's a great show and I love Justine Clarke. The weather is foul here in Melbourne, hope you guys are faring better in Sydney. Eating Paper. Bless. At least he isn't yet eating dirt. But anyway I'm still loling at Bec Hewitt's face consumption..